For the second year in a row, we set out to find out which businesses go beyond the call of duty to hire and retain veterans. Yet of the veterans surveyed in the index, only a little more than half say they are confident about finding a job. In recognition of this challenge and in honor of Veterans Day, Monster—in partnership with Military.com—set out to find which companies are currently going beyond the call of duty with their veteran hiring initiatives, with active recruitment, thorough onboarding and strong retention. To assemble this second-annual list (view our 2015 winners here), we turned to a panel of seven veteran hiring experts each of whom nominated 10 companies. We then reached out to the nominated companies for data about their hiring practices. Finally, we ranked each company, starting with the percentage of year-to-date 2016 hires who were veterans, as that shows a current commitment. See below the winner profiles for the full methodology. What the company does: ManTech provides technology solutions in information systems, environment, telecommunications, defense and aeronautics. What we liked: ManTech, nominated for the first time this year, skyrocketed to the No. 1 position in 2016. That’s because the company had the highest percentage of veteran hires (38%) in 2016 and nearly half of its workforce is comprised of vets—which is 16.2 percentage points higher than any other company we surveyed. Additionally, ManTech told us it is aiming for one-third of all new hires in 2017 to be veterans. The company credits these numbers to its recruiters, who are all at least partly focused on veteran hiring; ManTech told us all of its recruiters dedicate between 25% and 75% of their time to recruiting veterans. Once onboarded, ManTech’s ex-military staff can take advantage of the company’s unique benefits, which include free training for certifications, professional education from ManTech University and mentoring and assistance programs. Find jobs at ManTech on Monster. What the company does: U.S. Customs and Border Protection, one of the world’s largest law enforcement organizations, safeguards America’s borders to keep terrorists and weapons out of the U.S., while also facilitating lawful international travel and trade. What we liked: Of all the companies surveyed, CBP had the second highest percentage of veterans hired in 2016, and the third highest percentage of total workforce. CBP representatives attend national military conferences, advertise in military publications and on websites, and conduct various recruitment and outreach activities at military installations and affiliated organizations. And in addition to a full-time Veterans Program Manager who advocates for the placement of veterans and transitioning service members, CBP has the Office of Training and Development that provides veterans with mentoring, developmental opportunities and rotational assignments to enhance their skill sets for advancement within CBP. Find jobs at U.S. Customs and Border Protection on Monster. What the company does: Lockheed Martin is a global aerospace, defense, security and advanced technology defense contractor. What we liked: No stranger to the top of Monster’s annual list (No. 1 in 2015), Lockheed Martin cracked the top three with its strong veteran hiring numbers—the company has the third highest percentage of 2016 veteran hires on our list. And nearly a quarter of this company’s staff is ex-military. Chalk it up to the company’s dedicated four-person Military Relations Team—in place since 2005 and made up of vets from the Army, Navy and Marines—which is focused on full-time recruitment outreach to transitioning veterans. Plus, the company also offers affinity groups that provide mentoring opportunities and conducts a Military/Veterans Leadership Forum that focuses on creating services to support and develop veterans at the company. Find jobs at Lockheed Martin on Monster. What the company does: Booz Allen Hamilton provides management and technology consulting and engineering services to major corporations, governments and not-for-profit organizations. What we liked: Of all the companies surveyed, Booz Allen Hamilton—which also appeared on Monster’s 2015 list—had the second highest percentage of veterans as a share of its overall workforce. And it had the fourth highest percentage of veterans as a share of 2016 hires. The company’s Armed Services Forum and Military Spouse Forum have more than 1,500 members between them and provide opportunities for mentoring, professional development, networking and volunteerism. In addition, Booz Allen Hamilton’s Veterans Agenda (a group of 20 senior leaders) works closely with both forums to identify emerging issues and needs of the military communities. And according to the company’s internal voluntary reporting, Booz Allen Hamilton employees logged 21,000 volunteer hours with more than 170 different veteran organizations last year. Find jobs at Booz Allen Hamilton on Monster. What the company does: Schneider National is a provider of trucking and transportation logistics services. 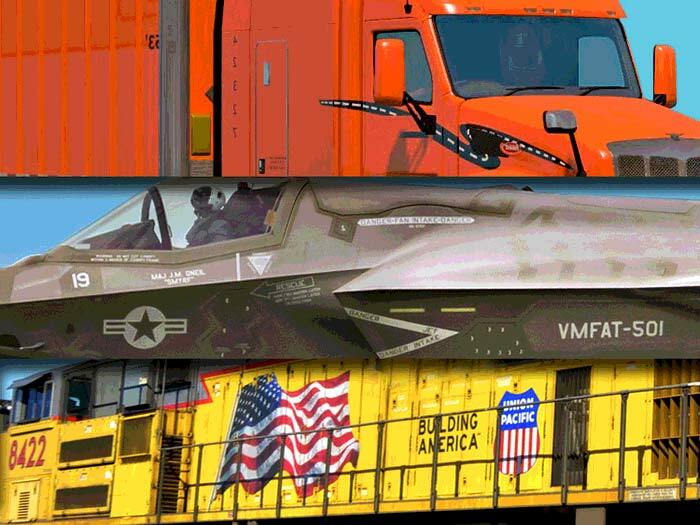 What we liked: More than a quarter of Schneider’s 2016 hires and total workforce is made up of veterans—and half of its recruiting team are veterans too. Schneider offers plenty of training opportunities to those transitioning, including formal mentors for new hires from the military community and apprenticeships to help transition military veterans and service members into new jobs. Schneider also has a “fast track” program to identify veterans with high career potential to help maximize their opportunities within the company. Find jobs at Schneider National on Monster. What the company does: Union Pacific is a railroad franchise that transports goods across 23 states. What we liked: Making its second appearance on our list, Union Pacific continues to actively recruit veterans by hosting regional military leadership hiring programs—and the results are in line with last year (when the company reported 24% of hires were vets). Additionally, Union Pacific has eight employee resource groups that provide support, networking and mentorships to veteran employees. New hire veterans at the company are also partnered with current employee veterans to help support the transition into a civilian career. Find jobs at Union Pacific on Monster. What the company does: Raytheon is an international technology company specializing in defense, civil government and cybersecurity solutions. What we liked: In its first year as a nominee, Raytheon, which employs more than 10,000 veterans, cracked our top 10. Raytheon is recognized for its strong percentages of hires and staff, and also for its dedicated recruitment efforts. The company participates in more than 30 military base career fairs a year, in addition to hosting multiple virtual career fair events targeting transitioning military. The company’s veteran employee resource group, RayVets, promotes and recognizes veterans’ contributions and works to create an impact in the business through veterans’ involvement in product and service solutions. Find jobs at Raytheon on Monster. What the company does: BAE Systems, Inc. is a defense, aerospace and security company that engineers and manufactures products and systems to support military capability. What we liked: BAE Systems, making the top 10 list for the second time, improved upon its impressive 2015 veterans hiring percentage by 1 percentage point this year. The company also upped its total veteran workforce population 2.4 percentage points over 2015. Additionally, BAE Systems had the highest 12-month veteran retention rate (90%) of all companies included in our 2016 survey. The company has a variety of programs and resources dedicated to hiring and retaining veterans including the Warrior Integration Program, which assists in employment transition, education and career development of combat-wounded service members. Find jobs at BAE Systems, Inc. on Monster. What the company does: The Boeing Company is one of the world’s largest aerospace manufacturers, specializing in designing, building and selling airplanes, rockets and satellites. As of 2013, Boeing is the second-largest defense contractor in the world. What we liked: Boeing, a first-time nominee to the list, has a strong share of veteran hires and staff and a dedicated military programs team consisting of five people. One recruiter on this team is solely devoted to military recruitment, and the entire team is made up of ex-armed forces members. Boeing also hung on to 88% of its 2015 veteran hires beyond 12 months, good enough to finish in a three-way tie for second place in retention rate. Also, Boeing offers a variety of veteran education and training programs—the company is a founding member of Joining Forces, a White House initiative, which provides employment resources and education to ex-military looking to transition into civilian life. Find jobs at Boeing on Monster. What the company does: General Electric is a multi-national company that operates in the power and water, oil and gas, aviation, health care and transportation segments. What we liked: First-time nominee GE has cracked the top 10 for its hiring numbers (and the company reports that the 1,696 veteran hires in the U.S. for 2016 is a record high). But GE isn’t just committed to hiring veterans; the company has robust programs in place to help veterans succeed once they’re employees. GE’s Veterans Network helps with onboarding, and the GE 101 program provides training for veterans new to the company. Plus, the Junior Officer Leadership Program is a two-year rotational program designed to help exceptional military officers transition to successful GE careers. Find jobs at General Electric on Monster. Monster asked each of these experts to nominate the 10 companies they thought were this year’s standouts for their veteran hiring and retention practices. Our staff then reached out to each of the nominees for the following additional information: what percentage of the company’s 2016 hires were veterans; what percentage of the total workforce is veterans; what the retention rate was for 2015 hires; what 2017 recruitment plans it had for veterans; whether it has a dedicated veteran recruitment team and whether any of that team is ex-military; and what kind of special programs it offers for onboarding, development and retention. We ranked first on 2016 hires, then on total workforce and finally used the other data points to inform our final rankings.